It's been a rough day, and I'm doing this late, so I apologize for paucity. I've also gotten some feedback about layout and discussion of products. A lot of this is balanced by the huge number of products that come out each week. It leaves me to ask, what's better? An overview of lots of different things, or a more in-depth highlight of just a handful (3-5) products? My initial thought was the former, but if preferences is for the latter, let me know. 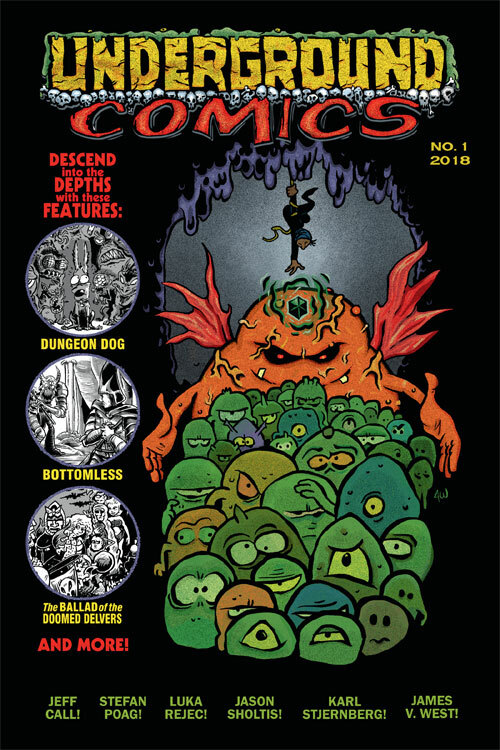 Underground comics is finally out! Down twisting passages, you’ll find dungeoneering dogs, slumbering giants, eldritch sacrifices, bottomless pits, brownie poets, and more! I'm excited about this, just because of the artists involved. New work from James V. West, Karl Stjernberg, Jason Sholtis, Luka Rejec, Stefan Poag, Trey Causey and Jeff Call. Lots of exciting names in that list. I haven't gotten my copy yet, so I'm unsure as to the official format and frequency. It's 36 pages for 2.99$. I think it's phenomenal for a group of artists in the classic gaming scene to put something like this together, but can't imagine the economics of it. That's so many full pages of art from so many talented artists. I hope we see more of it from the future. The Ultraviolet Grasslands (UVG) is a rules-light rpg pointcrawl module inspired by psychedelic heavy metal, the Dying Earth genre, and Oregon Trail games. It takes a group of ‘heroes’ into the depths of a vast and mythic steppe filled with the detritus of time and space and fuzzy riffs.The UVG is for referees, game masters, judges, players, and fans of role-playing games who want to run a months’ long science fantasy Marco Polo-style voyage across a weird, old world.The UVG is for any gamer who wants to mine it for inspiration, adventuring locations, odd characters, maps, items, and random encounters.The UVG is also an artbook knitting together my art and maps and writing. Yes, every nut and fault, from layout to lamarckian monstrosity, is my own work.It is also still a work in progress. The responsibility for every typo, every error, and every missing stat block, is entirely mine.Now, enter the silver machine. I'm excited by this. Alex Hakobian of Bloody Eye Games released Broadsword this week. It's got a bunch of art from people like Gennifer Bone, Eric Quigley, Devin Night, Gary Chalk, and Jenna Fowler. And it's about the intersection between board gaming and traditional role-playing games. Broadsword is an epic fantasy adventure game that seamlessly brings together elements from classic board games with elements from tabletop roleplaying games to result in something truly extraordinary — not quite a full RPG, but much more than a simple board game.Complete Rulebook - Everything you need to play the game. Just grab some friends and either a gridded game mat or a virtual tabletop and get ready to start your adventure! Finally, James Shields is having a Kickstarter for some of his stock art, and it's pretty incredible. The art is designed using layers, so you can customize the presentation. It's a great way to give stock art purchasers the opportunity to get something individualized. But that's not the only thing: It's also a way to pick up a lot of related .pdfs on the cheap. At the 15 dollar level, you get 15 books, from role-playing games to modules to setting books. There's even more at higher levels. James is a great artist, so I'm always glad to see more of his work. So, yeah. I'm going to be checking that out this week. John Carlson and his blog dwarven automata, handed out links to his wilderness hexcrawl tracker to go along with his dungeon time tracker. Also, this isn't a new release really, but some of the things +Jonathan Newell is doing is just really incredible. I mean, look at it. I love all the cool drawings. Did you know there is a Glorantha comic book? I didn't. Prince of Sartar has been running since 2014. Color me amazed. 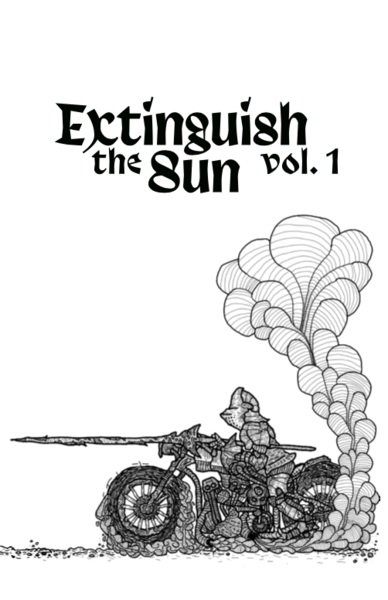 Extinguish the Sun is a zine for fans of the Old School Renaissance (OSR) and associated games. This issue contains a systemless description of the City in Chains, a metropolis bound by the walls its long-dead yet still ruling monarch built around it, and rules for running a post-apocalyptic Mad Max/Tank Girl-inspired campaign in B/X. It's 3.00$ Just for Evlyn's beautiful art alone, that's a steal. The fact that Chance is a creative force in classic gaming is just a great bonus. It's also available on rpgnow here. Probably why Prince of Satar showed up in my feed, there's a full color release of the Glorantha classic role playing game. Palladium Fantasy has a release of PFRPG 12: Library of Bletherad. Palladium products are a blast to read, usually. Also The Rifter #76. James Spahn AKA barrel Rider Games released a 91 page art-free Swords & Wizardry streamlined adaptation called Untold Adventures. From Raging Swan Press, we've got a Sun & Sand Compilation as a campaign starter. It's got 3 villages, a place of power, their desert setting book, along with 20 events/locations in the sunscorched desert. It's nice, along with a discount on the package deal. I mean, the individual releases have been combined into a single print volume resource for desert campaigns, which is both useful and convenient. There's a book from Dancing Lights Press, Arcane Theory by Berin Kinsman, a 79 page book containing some ideas for story generation and story effects of different magical ideas. Castles & Crusades has two modules and a setting available for sale. The Burning Firmament is an adventure for levels 4-6. Caverns of Ambuscadia is an adventure for levels 5-6. Both are written by Davis Chenault. Also, there's a bundle of the Inzae setting, a brutal land created by a dying dragon. There's some setting books and an adventure in the bundle. Is Yoon-Suin getting a second edition? Over in the official Yoon-Suin G+ community, David McGrogan asks what people would like to see in a hypothetical edition of Yoon-Suin. The creator of the HMS Apollyon megadungeon is stepping away from classic gaming because it isn't fun for him anymore and he's maintaining his site as an archive. He said "the 'OSR' scene this blog is devoted to has become a rather disgusting place where crass commercialization is strangling a formlerly creative amateur community" and I have to ask, do you agree? I can't say that I do. Not only do I make my living making these things, I'm glad I live in a world where I can get so many awesome things. Would any of these great zines and things, these comics, these wonderful dreamlike works of art be made for free? Is 3$ for a book full of Chance's writing and Evelyn's art "crass commercialization"? Perhaps its a question of value. Maybe people are less likely to create because there's more commercialization? It it strangling them? What do you think? Was that an awesome list? It'd be great if you support me or tip me! "It leaves me to ask, what's better? An overview of lots of different things, or a more in-depth highlight of just a handful (3-5) products?" Forced to choose, I'd prefer the latter. Speaking for myself, I'd say that the number of products reviewed is less important to me than the quality of the products. I like hearing about anything that you think is cool enough to be worth drawing attention to. (This is basically how I use your "On Never Being Able To Find a Table" list too.) I don't really have time to check out lots of gaming products each week, or even each month, but if Courtney Campbell thinks something is worth recommending then that product gets a little mark in my head next to it that says "Remember to check this out." So, basically, don't worry about the format, just write what you feel like and it will be valuable to me. I'm enjoying the overview of lots of cool different releases,but don't feel forced to settle on a single format. Mixing things up everyone in a while with longer or shorter reviews could be refreshing. But if you do decide on a longer review could you still just list out the notable releases in a section? Even just a list with no commentary would be nice. You collation of releases is really helpful to find new stuff, and I don't know how to tell when stuff is coming out all the time. Thanks!